How was Lady Musgrave Island Created? Believe it or not, the “land” that forms the Great Barrier Reef is the remains of sediments of the Great Dividing Range (Australia’s largest mountain range). It extends over 2500 kilometres along the coast line of Queensland. Wow isn’t that amazing! There are many types of reefs throughout the Great Barrier Reef however at the Southern End, we are graced with reefs that also include a coral cay. A coral cay is actually an island formed from the loose coral sediments that are broken up by prevailing winds and “pushed” into an area of the reef where it deposits, settles and begins to form the cay. There are many cays on the Great Barrier Reef however Lady Musgrave is the only one that you can gain ACCESS into the partially protected waters of the lagoon, within the walls of the reef itself. 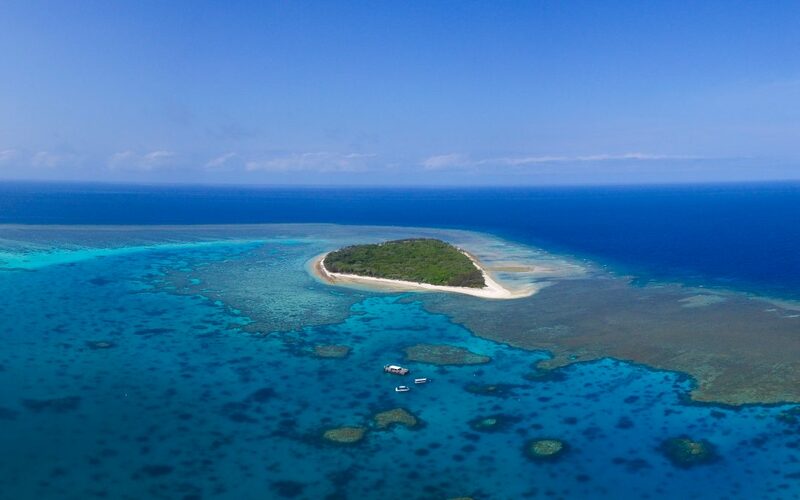 Lady Musgrave Island is over 19 hectares (49 acres) and is properly described as a wooded, sandy cay. It has been built by wind driven waves, pushing coral rubble, sand and broken shells to one end of the reef. Now it is held together by the roots of trees and shrubs, fertilised by the bird droppings of those that nest, live and breed on the island. The lagoon is surrounded by an oval shaped coral ring, striving to grow outward which has collapsed in the centre. The reef consists of over 3000 acres comprising of cay (island), lagoon and reef, with the lagoon itself around 1000 acres. Great, broad-leafed Pisonia trees (Pisonia Grandis) dominate the island’s interior. They are soft wooded and shallow rooted so they sometimes topple or drop branches in strong winds and storms but continue to live in a tangles mat of trunks and roots. The Pandanus thrives around the island’s edge on strong roots that bind the soil and sand. Casuarina Pines thrive in the open spaces and their fine leaves give great shade. Octopus Bush are around the foreshore and Sandpaper Figs can be found inland.